LOS ANGELES — Drop this tactical-style vest onto your shoulders and fasten it high on your chest, and you’re suddenly feeling the action. Using audio-based haptic technology (the kind of rumbling vibrations that you’ll find in any video gaming controller), the KOR-FX turns the audio in the game into rumbles you can feel. The makers of this new gaming peripheral have a few prototypes set up on the show floor at the Electronic Entertainment Expo in Los Angeles this week, and they’ll let all comers come and try a demo. 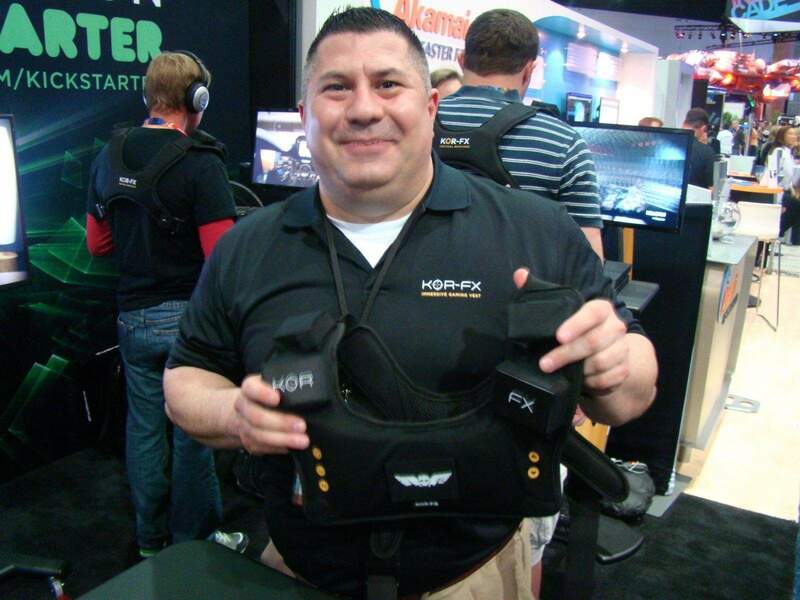 Strapping on the vest over my chest with velcro closures, Fandetti (pictured below) told me that the vest is currently on Kickstarter, and they’re looking to bring it to the retail market soon for gamers who want to immerse themselves into their games. He’s excited about this, since this is the first time in a five-year development cycle that a production-level unit has been available to people to try out. Even more than a standard console controller, the KOR-FX vest definitely helped ratchet up the intensity of the video I watched, with pulsing vibrations during revving engines, low-intensity vibrations in a racing game, and environmental vibration to stimulate the limbic system. All the in-game sounds turned into buzzy feedback thanks to a little box that connects to a computer or video game console. 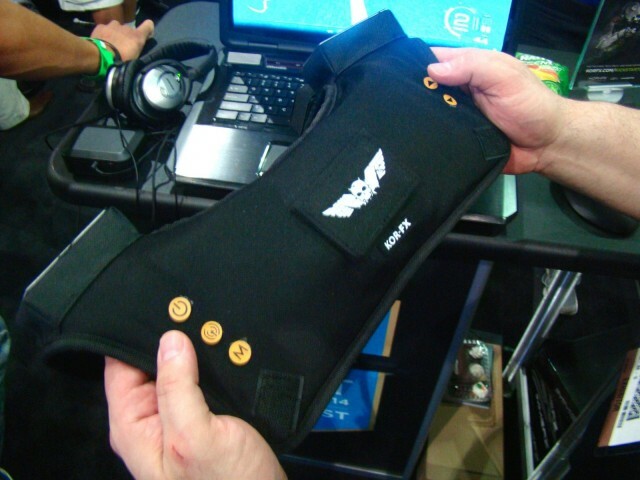 The vest itself connects to the console or computer via a wireless connection with that little box. The tester before me, a tall guy with a full head of curly hair, said to his buddy, “Man, that just made me feel even more anxious!” He smiled and dropped a card with Fandetti on the way out, who said that this is the common reaction when people try on the vest. The KOR-FX tactical gaming vest will be available this year at a variety of online and brick and mortar retailers, according to Fandetti. He’s keeping mum on a suggested retail price, but you can net yourself a vest when it releases via the Kickstarter project for a relatively affordable $150. With this and other initiatives like virtual reality and 4K television sets making gaming more immersive these days, it’s a wonder we ever leave the house.